I don’t care if you have 3 hours of homework left. If your friend is crying, you need to go comfort her. If your boyfriend is upset, you need to go give him a hug. If your mother wants to talk, talk to her. If your brothers are jumping in leaf piles, go join them. If your family wants to go out to eat, go with them. You can’t miss your life because of the demands of school. but life… you can’t push that off for later. more important than actually living your life. 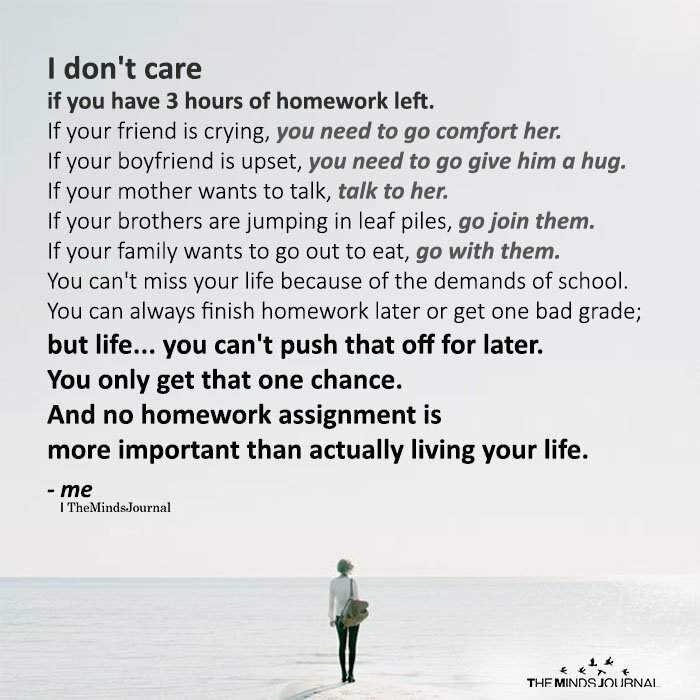 What if getting that homework done is part of living your life? I don’t really agree with this, we sometimes have to put ourselves first too. A good friend understands that. From a mother’s point of view…. I do NOT agree with this post. Unless you need a 4.0 plus to go to college and realize that dream….some of us need the scholarships.